According to the Bible, after fleeing Egypt the Hebrews were led by Moses to the promised land of Canaan. Moses sent twelve spies into Canaan (one from each of the Twelve Tribes) to report on what awaited them. Ten spies returned with exaggerated stories of giants who would kill the Hebrew army if it entered Canaan. Two spies, Caleb and Joshua, came back with valid reports, that the Hebrews could inhabit the area. As a result of the false reports from the ten spies, the Hebrews did not enter Canaan but instead wandered the desert for another forty years, before they finally took up residence in the promised land. At the end of the forty years, Caleb and Joshua were the only adults that survived the forty-year journey, a reward from God for their obedience. Catalina Island off the coast of California is more correctly referred to as Santa Catalina Island. Santa Catalina is one of the Channel Islands of California, and is located in Los Angeles County. Santa Catalina has been a major tourist destination since the early 1920s when William Wrigley, Jr. of chewing gum fame invested millions of dollars to develop needed infrastructure to attract visitors. Wrigley owned the Chicago Cubs at the time, and so he made the Chicago Cubs use the island for spring training, as part of a publicity campaign. The Cubs trained there until 1951. Volgograd is a Russian city on the Volga River. Known as Stalingrad from 1925 until 1961, the city is famous for the Battle of Stalingrad against the German Army in WWII. The Soviets emerged victorious after just over five months of fierce and brutal fighting in what is believed to be the bloodiest battle in the history of warfare. The Spanish province of Las Palmas comprises about half of the islands of Gran Canaria, and several other small islands, located off the northwest coast of Africa. Gran Canaria is perhaps better known as the “Canary Islands” in English. The province takes its name from Las Palmas, the capital city of Gran Canaria island. The flowers of the cacao tree grow in clusters, directly on the trunk and on older branches. The pollinated flowers turn into ovoid cacao pods, each of which contain 20-60 seeds or beans. The seeds are used as the main ingredient in chocolate. Mole poblano is a classic dish that is sometimes cited as the national dish of Mexico. Two of essential ingredients in the recipe are chili peppers and chocolate. The chocolate doesn’t dominate the taste, but does serve to offset the heat from the peppers. Back in 1964, the second most watched show on American television was ABC’s “Bewitched”. Sidney Sheldon was tasked with the job of creating a rival sitcom and he came up with “I Dream of Jeannie”, which first aired in 1965 and starred Barbara Eden in the title role. The censors had a big say in how the story developed. For starters, Jeannie’s skimpy costume was permitted on air, provided that Eden didn’t show off her navel on the screen. Also, Jeannie was only allowed to live with an unmarried man as long as the story made it clear that she slept in a bottle. Actor Larry Hagman is best known for playing two very different characters on TV shows: quirky astronaut Tony Nelson on “I Dream of Jeannie” in the 1960s, and ruthless oil baron J.R. Ewing on “Dallas” in the 1980s. On the big screen, I always remember Hagman playing alongside Henry Fonda in the excellent Cold War drama “Fail Safe” from 1964. “Lil Wayne” is the stage name used by rap artist Dwayne Carter, Jr. from New Orleans. “Koruna” is a word in some Slavic languages meaning “crown” and is used as the name of several obsolete European currencies. The Czech koruna is the only currency still in use that uses the name. Islamabad is a city that was purpose-built in the sixties to replace Karachi as the capital of Pakistan. The port city of Karachi had been the nation’s capital from 1947, when Pakistan gained independence from Britain. The nearby city of Rawalpindi was used as the temporary capital from 1958 until the necessary infrastructure was completed for Islamabad in 1967. Kabul is the capital and largest city of Afghanistan. The city has been the site of major conflict for much of the 3,500 years that it has been in existence. In the past, this conflict was mainly driven by the city’s strategic location on the major trade routes of south and central Asia. Herbert Marcus, his sister Carrie Marcus Neiman, and her husband A. L. Neiman, were partners with a tidy of profit of $25,000 from a business they had founded. This was 1907 Atlanta, and they were offered the chance to invest in a new company that was just starting to make “sugary soda drinks”, a company called Coca-Cola. The partners declined, instead returning to their home of Dallas and founding a department store they called “Neiman-Marcus”. Zeno of Elea was a Greek philosopher who lived in Elea, a Greek colony in Southern Italy. Zeno is famous for his paradoxes, a set of problems that really make you think! In the problem known as “Achilles and the Tortoise”, Zeno tells us that Achilles races a tortoise, giving the tortoise a head start (of say 100 meters). By the time Achilles reaches the starting point of the tortoise, the tortoise will have moved on, albeit only a small distance. Achilles then sets his sights on the tortoise’s new position and runs to it. Again the tortoise has moved ahead a little. Achilles keeps on moving to the tortoise’s new position but can never actually catch his slower rival. Or can he …? A knish is a snack food from Germany and Eastern Europe that was made popular in the US by Jewish immigrants. A knish has a filling, often made of mashed potato and ground meat, covered by a dough that is baked or fried. Todd Rundgren is a philadelphia-born musician who is known as a solo artist as well as a member of Utopia, a rock that Rundgren formed in 1973. He is also a successful record producer, with his list of production credits including Meatloaf’s “Bat Out of Hell” (1977). Rundgren was listed on the birth certificate as the father of actress Liv Tyler. Rundgren’s girlfriend Bebe Buell had a brief relationship with musician Steven Tyler while she and Rundgren were on a break, and that brief liaison resulted in an unplanned pregnancy and the birth of Liv “Rundgren”. Liv learned of her biological father when she was eight years old, and eventually took his name. Liv and Todd Rundgren remain close to this day. Hank Aaron hit his 715th career home run on 8th April 1974, breaking the record of 714 career home runs held by Babe Ruth. Aaron went on to hit 755 home runs prior to his retirement from the game in 1976. Elijah Muhammad led the Nation of Islam, the African-American religious and political movement, from 1934 until his death in 1975. During that time, he served as mentor to several famous people, including Malcolm X, Louis Farrakhan and Muhammad Ali. Google’s Chrome is now the most popular web browser used in the US, with Mozilla Firefox in second place and Internet Explorer in third. I find Chrome to be much, much more user-friendly than Internet Explorer, and more featured than Firefox. Chrome also works more seamlessly with other Google products and with Android phones. The Muppet “Rizzo the Rat” is named for Ratso Rizzo, a character in the movie “Midnight Cowboy” played by Dustin Hoffman. Enrico Salvatore “Ratso” Rizzo is one of the characters in the groundbreaking 1969 movie “Midnight Cowboy”. Rizzo is a down-and-out con man played by Dustin Hoffman. A burrito is a common dish served in Mexican cuisine. It is a flour tortilla filled with all sorts of good stuff. The term “burrito” is Spanish for “little donkey”, the diminutive of “burro” meaning “donkey”. It’s thought that the name was applied as a burrito looks like a bedroll or pack that might be carried by a donkey. Gina Gershon is an American actress. Gershon has played a lesbian on screen a number of times and has become somewhat of a gay icon. “Dark web” is the name given to content on the World Wide Web that requires specific software and/or authorization for access. The dark web is a subset of the “deep web”, the collection of content on the Web that isn’t indexed by search engines. Dark web users refer to the regular Web that you and I access as “Clearnet”. Honduras is a country in Central America that used to be known as Spanish Honduras, in order to differentiate it from British Honduras that is now called Belize. “Honduras” is the Spanish word for “the depths”, which is probably a reference to deep coastal waters. Abe Vigoda played Detective Sergeant Phil Fish in television’s “Barney Miller” in the seventies, and even got his own spin-off show called “Fish”. On the big screen, Vigoda played Sal Tessio in “The Godfather” and Grandpa Ubriacco in “Look Who’s Talking”. Lani Guinier was the first African-American woman to achieve tenure at Harvard Law School. English actor and comedian Hugh Laurie used to be half of a comedy double act with Stephen Fry called simply “Fry and Laurie”. Fry and Laurie met in Cambridge University through their mutual friend, actress Emma Thompson. Over in North America, Laurie is best known for playing the title role in the medical drama “House”. An iceberg is a large piece of freshwater ice that is floating freely after having broken off from a glacier or ice shelf. Out use of “iceberg” comes from the Dutch word for the same phenomenon “ijsberg”, which translates literally as “ice mountain”. French-Canadian singer Céline Dion first came to international attention when she won the 1988 Eurovision Song Contest, in which she represented Switzerland in the competition that was hosted in Dublin, Ireland. She is now the the best-selling Canadian artist of all time. Caesars Palace is one of my favorite hotels on the Las Vegas strip, even though it is beginning to show its age. Caesars opened in 1966. The two sides of a coin are known as the “obverse” and the “reverse”. The obverse is commonly referred to as “heads”, as it often depicts someone’s head. The reverse is commonly called “tails”, as it is the opposite of “heads”. Prepaid cell phones are sometimes referred to as burner phones in the world of crime and policing. Anyone can buy a pay-as-you-go phone, and then top it up with a cash transaction. There is no need to register the phone or SIM card, and so police cannot track the phone’s owner. Nefarious characters might use such a phone to facilitate a criminal transaction, and then “burn” (discard) it, before buying a new phone in a retail outlet. San Angelo is a city in West Central Texas. It was founded as a village in 1867 outside Fort Concho, one of a series of frontier forts established around that time. Settler Bartholomew Dewitt named the village Carolina Angela, after his wife. The later changed to San Angela, and eventually to San Angelo in 1883 at the insistence of the “grammar police” in the US Postal Service. In the spirit of Charles Darwin, the Darwin Awards commemorate individuals who protect our gene pool by making the ultimate sacrifice of their own lives. Darwin Award winners eliminate themselves in an extraordinarily idiotic manner, thereby improving our species’ chances of long-term survival. Apparently the original “smart Alec” (sometimes “Aleck”) was one Alec Hoag, a pimp, thief and confidence trickster who plied his trade in New York City in the 1840s. A smart Alec or wise guy might be called “Wisenheimer”. The term is mock German or Yiddish and dates back to the very early 1900s. The African Methodist Episcopal Zion (AME Zion) Church was formed in New York City. The church was established by African-American Christians who faced discrimination when attending other churches. Initially the African-American congregations were led by Caucasian Methodist ministers, with the first African American being ordained in 1820. O’Hare International was the world’s busiest airport from 1963 to 1998. The original airport was constructed on the site between 1942 and 1943, and was used by the Douglas Aircraft Company for the manufacture of planes during WWII. Before the factory and airport were built, there was a community in the area called Orchard Place, so the airport was called Orchard Place Airport/Douglas Field. This name is the derivation of the airport’s current location identifier: ORD (OR-chard D-ouglas). Orchard Place Airport was renamed to O’Hare International in 1949 in honor of Lieutenant Commander Butch O’Hare who grew up in Chicago. O’Hare was the US Navy’s first flying ace and a Medal of Honor recipient in WWII. The official name for the country of Laos is the Lao People’s Democratic Republic. In the Lao language, the country’s name is “Meuang Lao”. The French ruled Laos as part of French Indochina, having united three separate Lao kingdoms. As there was a plural of “Lao” entities united into one, the French added the “S” and so today we tend to use “Laos” instead of “Lao”. In the strict sense of the term, “Indochina” is a region in Southeast Asia that corresponds to the former French territory known as French Indochina. Today this region is made up of the countries of Cambodia, Laos and Vietnam. However, the term “Indochina” is more generally used to describe Mainland Southeast Asia, and in this usage it also encompasses Myanmar, Singapore and Thailand. In a work arranged alphabetically, Volume 1 might be “A to M” and Volume 2 might be “N to Z”. The Japanese honorific “-san” is added to the end of names as a title of respect, and can be translated as “Mr.” or “Ms.” The usage is wider than it is in English, though. Sometimes “-san” is added to the name of a company, for example. LAT: 23:04, 2 dumb errors. WSJ: 10:07, no errors. Don’t see anything with the meta. Newsday: 12:11, no errors. Yesterday’s BEQ: 45:33, 3 errors. Took too long to break into the puzzle, as is the case with everything I do. As noted before, this was part of the 2013 ACPT. This puzzle had a time limit of 30 minutes, so between that and the 3 dumb errors, it’s a good illustration of why I’m going to stay away from most of these things. LAT: didn’t know “burner” as “Phone in crime shows.” Live and learn. Since Laos is landlocked, it can not, by definition, be a peninsula. But it can still be a part of the Indochinese Peninsula, if it’s the countries surrounding it that keep it from having access to the ocean. But the whole of the Indochinese Peninsula can. Laos is part of that peninsula. @Allen … I’m not sure what you’re trying to add here. As @FAS said, a peninsula, by definition, cannot be landlocked. As I said, a portion of a peninsula (such as Laos), can be landlocked by virtue of the presence of other portions of the peninsula (such as Cambodia, Thailand, and Vietnam). But Laos may still be described as an “Indochinese Peninsula nation” (in the same way that Chad may be described as an “African nation”). I suppose, if you really wanted to nitpick, you could say that the clue should have been “Nation on the Indochinese Peninsula” (but surely no one here would be that nit-picky 😜). LAT: 11:43, no errors; didn’t know what to make of “burner”, but all the crosses looked solid, so I went with it. Newsday: 10:48, no errors. WSJ: 12:14, no errors; thought about the meta for a bit last night and woke up this morning with a perfectly logical answer running through my head, but have no idea how to justify it. Croce later. 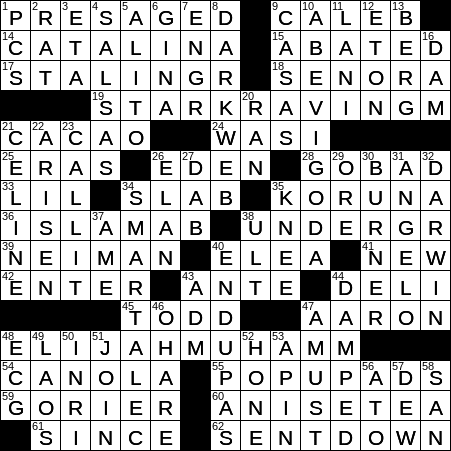 Croce’s latest was another “anagram crossword”, in which the clue for each entry is written for an anagram of the entry, rather than for the entry itself. This one took me about an hour and a half and I finished without any errors. A pretty good workout for the little gray cells (and really not all that difficult, just time-consuming). @ RBJ and Dave…A burner phone is one usually purchased by criminals because it is untraceable and can be thrown away. Now if someone can tell me what damped means ? 32:50 with 1 error (daiped for damped) I was thinking Muhamiad instead of Muhammad. sound. Using a mute in a horn would be one way to dampen the sound. our best week ever. 3 blank squares in 5 whole puzzles, i.e. average 99.7%. don’t use any kind of timer, rather just try to solve them in whatever time it takes. I thought was the theme, though I didn’t have a name for it. Kudos to all and looking forward to Monday. @Jack … Thanks for the definition of a “burner” phone! And I think John has the right of it about “damped”. Any sort of signal can be “damped” (though “stifled” would not necessarily be the first synonym that occurred to me). Bill’s solve in single digits gets a tip of the “Crossword Cap” from me…kudos Bill! No final errors and catching on to the gimmick earlier in the solving than is typical for me helped quite a bit in wrestling this beast into submission. 54 fits as either a c or a k. The oil can be spelled with a c or k although a c is usually used. Both ECG or EKG fit 48 down. 14:43 and 4 errors around misreading the GORIER fill. The “gimmick” reveal elicited a groan, but I suppose it was a *little bit* clever. At the very least I “got” it long before the revealing clue at the bottom. Drove home to Utica from Albany airport in a snow storm just now. Isn’t it two days into spring??? Needed to work the puzzle to calm my nerves..!!! Easy Friday. Although thought Czech money was Korona but needed the u for the perp. I too, got the theme when I came across Islamabad ! I knew the capital…… … but not enough letters …. so I thought, correctly, that some fiendish game was involved. It’s curious that the suffix – bad means “named after” … as in after Islam … thus Ahmed-abad , Hyderabad-abad , Abbot-abad ( where Osama bin laden was killed -) etc. Abbot was a british major and administrator in the 1890’s. I had a good time with this rather difficult Friday puzzle. Monday is only around the corner. Regarding :: Burner phones …. … .. without a complete identity check and a security check of you, your job, your residence and your bank account. This TSA type security check was legislated 25 years ago, to prevent phones being used in terrorism and remote control bombings.. So burning a telephone won’t help. Oh, how I truly DESPISE gimmick puzzles. This one is even worse than a “rebus” puzzle. As soon as as I figured out the missing “AD” gimmick, I quit the puzzle entirely, in disgust. If constructors can’t make a puzzle with whole words, with one letter to a square, within the grid, then they should admit their ineptitude and give up the business. Mostly easy Friday for me; took 29:26 on-line with two peeks..so probably about 38 without cheating. Figured out the trick on the first theme answer, so that helped a lot. Ran into issues with KORUNA, ANGELO, DARWIN and UNDERGR, so peeked two letters. Poor SNL, they won’t know for sure what to make fun of in the opening unless more info comes out…in any case I’ll be watching. No errors on a challenging Friday. I also happened to fill in the reveal answer early on, so that helped. For “Title of respect in Tokyo,” SENSEI would be better than SAN…”SAN” is just used as Mr. or Ms., or with a given name, tho it comes after the name. SENSEI is used for a teacher or wise elder. Such is my understanding, anyway. DIRK– I too shall be watching– and I hope we get a lot of the info….